IMPORTANT NOTICE — Please read! As of 10/10/18, this trip is full. We sometimes have cancellations, so if you are still interested in going, please sign up for the waiting list and we will contact you if space becomes available. Steamboat Ski Resort, spread across the Mount Werner range in northwestern Colorado, features a wide variety of terrain for skiers of all abilities. 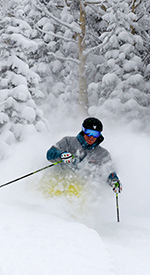 It is particularly noted for its extensive collection of blue groomers, open aspen glades, and dry "Champagne Powder". With a summit elevation of 10,568', Steamboat is a couple of thousand feet lower than most Colorado ski areas, making altitude adjustment a bit easier. Three on-mountain lodges provide plenty of places to take a break or grab lunch without having to drop into the base area. And if you're tired at the end of the day or the weather gets bad, you can ride the gondola down from mid-mountain. Off the slopes, the area in and around Steamboat is a winter playground with opportunities ranging from snowshoeing and cross-country skiing to dog sledding and winter fly fishing. The adjacent town of Steamboat Springs has art galleries, museums, and numerous dining opportunities. We will be on hand for the First Friday Artwalk on Feb. 1, and our second week overlaps with the first few days of Steamboat Spring's famed Winter Carnival. We will be staying in 2-, 3-, and/or 4-BR condo units at the Canyon Creek complex, located in the resort village about 400 yards from the gondola station. An on-call shuttle is also available to transport skiers to/from the base area and into town. By popular demand, this unique trip offers an optional second week, giving participants the opportunity to settle in and enjoy all that Steamboat and the surrounding area has to offer. Spaces are limited and registration is first-come first-serve. Roundtrip airfare from Norfolk, VA to Hayden, CO.
Airport shuttle to/from Canyon Creek condos at Steamboat. Discounts are available for non-skiers, Ikon passholders, and children 12 & under. $25 discount for sign-ups by Sept. 30 with accompanying payments. For additional details, see the Steamboat 2019 trip flyer. All prices are per-person estimates and subject to change. Includes lodging, group dinners, and fees. Please make additional selections below for group air travel and lift tickets. Includes r/t airfare from Norfolk, VA to Hayden, CO with return on Feb. 2, 2019, plus airport shuttle to/from Canyon Creek condos. Discounted fares for the airport shuttle are available for seniors (65+, $10) and children (12 & under, $20). A credit will be applied to your account for members who qualify. Attention couples: Only one seat left; please contact the trip captain regarding alternative air options. Includes r/t airfare from Norfolk, VA to Hayden, CO with return on Feb. 9, 2019, plus airport shuttle to/from Canyon Creek condos. Discounted fares for the airport shuttle are available for seniors (65+, $10) and children (12 & under, $20). A credit will be applied to your account for members who qualify. Includes lodging, group dinner event, and fees. YOU MUST PROVIDE YOUR OWN TRANSPORTATION WITH THIS OPTION. Please make lift ticket selection(s) below. 5-of-6 day lift ticket for ages 13+ or for children 12 & under whose accompanying parent or guardian did not purchase a 5- or 10-day lift ticket. There is no senior discount on lift tickets. Select this option if you are staying for just one week. 10-of-13 day lift ticket for ages 13+ or for children 12 & under whose accompanying parent or guardian did not purchase a 5- or 10-day lift ticket. There is no senior discount on lift tickets. Select this option if you are staying for both weeks. Add days to your 5-of-6 or 10-of-13 day lift ticket at $57/day. Must be purchased in conjunction with the 5-of-6 day or 10-of-13 day lift ticket. Purchasing additional days as part of the trip package is substantially cheaper than adding them on later. Children 12 & under ski free with the purchase of a 5- or 10-day lift ticket by an accompanying parent or guardian. Ikon passes do not qualify for this discount. $30 discount off the regular price of an Ikon Base Pass when purchased as part of this trip. Military discount not available. Good for 5 days skiing at Steamboat, Big Sky, Sunday River and 12 more destinations, plus unlimited skiing at Snowshoe and 9 other resorts. NON-REFUNDABLE. Restrictions apply. See ikonpass.com for details. $20 discount off the regular price of an Ikon Pass when purchased as part of this trip. Military discount not available. Good for unlimited skiing at Steamboat, Snowshoe, and 10 other destinations, plus up to 7 days skiing at Big Sky, Sunday River and 11 more resorts. NON-REFUNDABLE. Restrictions apply. See ikonpass.com for details. Select this option if you have purchased an Ikon Pass or an Ikon Base Pass elsewhere. Extra charge for single occupancy room in a shared condo.